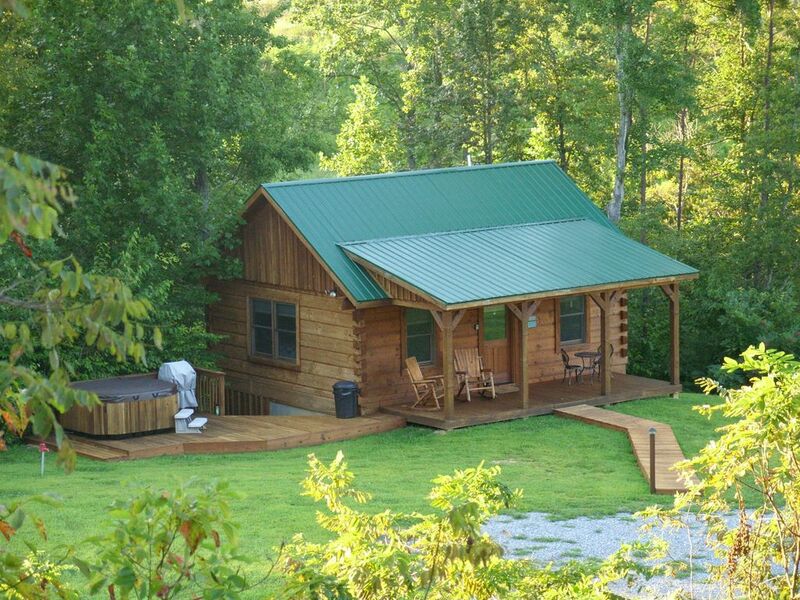 Lazy Creek Cabin is a couples getaway with a great mountain view. The log cabin is located on a 165 acre farm between Roanoke (15 miles) and Lynchburg (30 miles) and close to Smith Mountain Lake. So leave your worries, pets and children at home and bring your spouse for a relaxing stay at Lazy Creek Cabin. Spend time in the hot tub or in the rockers on the front porch enjoying the view of the Peaks of Otter. We are Jim and Jane Campbell and we have two grown sons. The cabin is located on our farm which is a working farm with Angus cattle. We will sell you a great steak or hamburger that was grass fed right here on our farm. We enjoy being hospitable and will make your stay as relaxing as possible. We decided to build a log cabin on our property because our view is so wonderful and we wanted to be able to share it. We are 1/2 mile off Rt. 460 and close to many restuarants, places to shop, the Peaks of Otter, and Smith Mountain Lake. We have a pond very close to the cabin and there are many places to hike and bike. We love it here on the farm, because the views off the front porch and the many wildlife you see, put us in awe of our Lord Jesus Christ the creator of it all! The kitchen is fully equipped with about anything you would need to cook with. 10 movies are there to use. I can not think of anything that would be a reason to rate this anything but 5 star. Very clean and well maintained. The owners went above and beyond to make this a great little cabin. Many places have cheap mattresses, furniture, appliances, etc. Not here, the mattress was extremely comfortable. The bedding and towels were of very high quality. They have a nice little fire pit outside with a nice stack of wood nearby. They even had some already stacked and ready to lite in the pit for us. We had not planned on visiting this area again, but that may have changed after this trip. Well worth our 500+ mile drive to come back to this cabin. We have stayed in vacation rentals in Hawaii, Indiana, Tennessee and possibly a couple other states and have not come across a better place. I can't say enough nice things about the property and the owners. Highly recommend to anyone, sure to be back. Great experience. We truly enjoyed ourselves!! This was our 3rd stay at Lazy Creek Cabin, and as always, it was a wonderful getaway. There are many reasons why we keep coming back — we really love the location, views, privacy, and hot tub. Jim and Jane are always so accommodating, and they think of everything to make your stay feel like a home away from home. We can’t wait to go back! Our 2nd visit... We love it! Just what every couple needs... Down time to enjoy each other's company. So relaxing and stress free. A beautiful cabin! Very nice place, Jane very helpful with the directions and a very nice getaway. Next time I know to make it at at least 5 days vice 3 days. We are 25 minutes from Roanoke and 45 minutes from Lynchburg. Smith Mountain Lake is about 25 minutes from us and there is boating, fishing and you can take a ride on the Virginia Dare. We are close (35 minutes) from the James River and you can go canoeing and kayaking there.